Soviet-made anti-aircraft gun spotted in Hamas military parade. 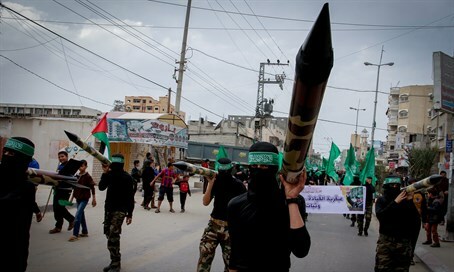 The Hamas terror group is acquiring anti-aircraft weaponry, the Al-Masdar news agency reported on Monday. A Soviet-built Gryazev-Shipunov GSh-23 anti-air heavy machine gun was reportedly spotted during a Hamas military parade in Gaza last week. The weapon is believed to have been smuggled into the Gaza Strip via the Sinai Peninsula by ISIS cells operating in the area. If confirmed, this would validate suspicions of expanding cooperation between Hamas and ISIS cells in the Sinai. Despite an ongoing blockade on Gaza imposed in 2007 following the Hamas takeover of the Strip, Hamas has managed to smuggle in an arsenal of weapons through a massive tunnel network stretching from the border city of Rafah in Gaza into the lawless Sinai Peninsula.